Connections. We hear that word a lot, but the idea of being connected to Jesus, not just to him, but his heart, that speaks to me. Jennifer Kennedy Dean is someone who should know about this kind of thing. She is a busy speaker and writer, sharing her ministry around the world. 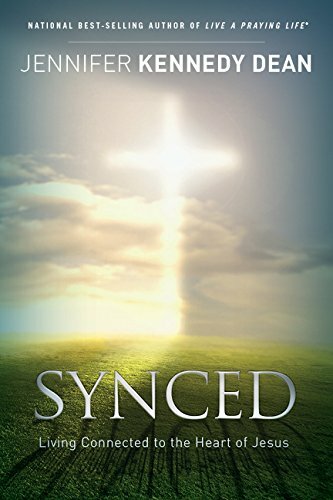 In “Synced: Living Connected to the Heart of Jesus,” she continues her great work. The author wastes no time getting down to business. In the very first chapter, she defines ‘living synced’ as a commitment to obedience; a word that cause many to cringe at when we hear it. As she continues to explain what she means, she reminds readers of how Jesus lived his life. When she tells us of Jesus’ prayer at Gethsemane, she paraphrases it to read, “Father, download Your will into my heart….” I love that she is comparing ancient text with current technology, something we can all relate to. Dean continues to inform the reader about what it means to live a praying life. This is something she has been doing most of her adult life. I like the idea of expanding our definition of prayer to make it more meaningful. She reminds readers that Jesus knows us and can teach us a lot about prayer if we just pay attention. He can also teach us about having a synchronized heart, as he did with God. In Chapter 4, Ms. Dean inspired me: “In Him is an unending soul at rest.” Now how could you turn that down? She goes on to explain that Sabbath is the state that God lives in, “…and invites us to live with Him at peace, at rest.” Invitation accepted! But she does note that the Bible tells us to make an effort to rest, which she says sounds like an oxymoron. Jennifer Kennedy Dean makes it so simple. All we have to do is live our lives in surrender and trust in God. For believers, this may be very familiar, but often not lived out to its fullest. It never hurts to have a reminder. I enjoy that the author includes stories throughout the book of real people who are living the synced life.